One of the coolest things about NAMM is the opportunity it creates for us to interact with builders and brands from all over the world. Two booth stops that we made at this year's convention worth highlighting were that of French brand Two Notes Audio Engineering and Canadian brand REVV Amplification. 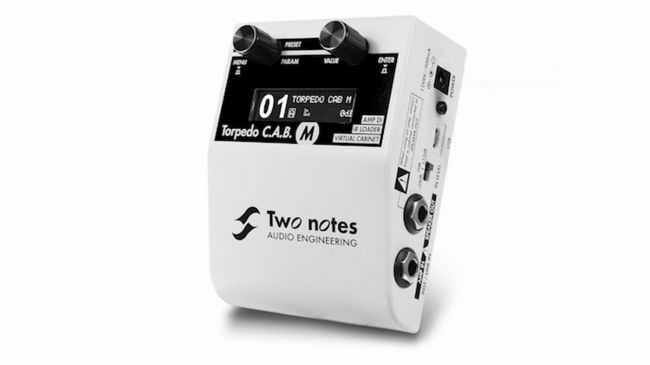 First up is Two Notes, who showed us the the new Torpedo C.A.B. Speaker Cab Simulator. This is an updated iteration of the brand's original iteration, and is specifically cool because it allows players to feed their preamp and/or pedalboard tone directly to PAs, front-of-house, or audio interfaces. This means you don't have to worry about speaker volume, which is great for players who are looking to make their rigs as PA-friendly as possible without sacrificing effects. The pedal packs 32 virtual cabinets to choose from (and you can always buy more in the Two Notes store), with eight mics and eight room sims, as well as power amp tube modelling. Users can control their software settings with a computer, smartphone, or tablet. Next, we stopped by the REVV booth to check out the brand-new D20 Amplifier, which is part of its Dynamis series. It's a 20 watts (but can be switched into a 4-watt mode, great for low-volume practice situations), with a push/pull gain knob—push for signature Dynamis cleans or pull for characterful crunch and dirt. But the really exciting part of this amplifier is that it actually has Two Notes Torpedo technology built-in, which makes it a great buy for players already familiar or for those looking to make their rigs even more portable and fly-in-friendly. As Dan from REVV tells Joe in the video above, "It allows for a quick six on the front, so you save six of your favorite speaker cabinet impulses to it. On the back, it has a balanced out—XLR—so you can take your signal to an interface, front-of-house, whatever you need, and there's a built-in load so you don't even have to run a cabinet from it, you can strictly use the Two Note stuff." Be sure to check out both of the new products from the brands above, and let us know what you think in the comments below. To keep up with our ongoing NAMM coverage from Anaheim, click here.